The programs we offer include white water rafting and a variety of other activities. 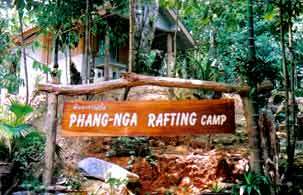 All tours take you to the beautiful scenery of the Phang Nga region, just North of Phuket Island. You visit a wildlife sanctuary, trek through the jungle on an elephant, and then take a 4WD vehicle further up river where you find the rafts. You also take a walk in the jungle to a beautiful waterfall, where you can swim.